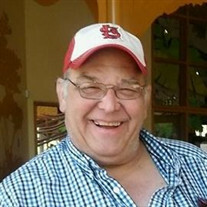 Robert Joseph Breeding, age 61, of Saint Peters, Missouri passed away on Friday, March 3, 2017. A memorial gathering in honor of Bob will be held 6:00 to 8:00 p.m. Wednesday, March 8, 2017, at the Smith Funeral Home & Chapel. He was born in Hannibal, Missouri on February 13, 1956 to the late Charles and Angela Mollman Breeding. Robert graduated from Hannibal Senior High School in Hannibal, MO. He worked in the grocery business for 42 years and was with Union Local 655, working first for National in Hannibal for 22 years and then as a Shift Manager at Schnucks until his retirement after 20 years. On April 12, 1975, he married the love of his life. He and Leslie were married for 42 wonderful years. Robert was a member of the Elks Lodge and was a Fourth Degree Knight in the Knights of Columbus. He previously was a member of Holy Family Catholic Church. In addition to his parents, mother and father-in-law, Tom and Barbara Whitaker, Robert was preceded in death by his son, Robert "B.J." Breeding, Jr., brother, Charles "Bill" Breeding, sister, Mary Jeanette Pettitt, and brother-in-law, Jimmy Whitaker. Those left to cherish his memory include his wife, Leslie Breeding; daughter, Alison L. Breeding; granddaughters, Kara and Lana Wallace; grandsons, Connor and Aidan Reis; sisters, Pat Brinkley (Lou) and Jane Smith (Pat); sisters-in-law, Melissa Breeding, Jean Ann Hatton (Jeff), and Connie Quinn and; brother-in-law, Tom Whitaker (Deanna), and a host of nieces, nephews, extended family members, and friends. Memorials may be made to the family to assist with medical expenses, in care of the Smith Funeral Home & Chapel.